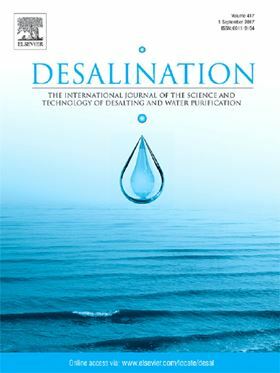 The research article 'Multi-Effect Vacuum Membrane Distillation systems: Model derivation and calibration' has been published in Elsevier journal Desalination. Vacuum Membrane Distillation (VMD) has been shown to be a promising desalination approach when going beyond the application range of Reverse Osmosis. Multi-stage arrangements in particular benefit from system-inherent heat recovery and thus yield low specific energy demand. Nevertheless, these systems show a complex behavior and therefore require a careful design, especially for higher salt concentrations which provide significant vapor pressure reduction. Previous experimental studies showed a need for a reliable system simulation tool, which we derived and calibrated in this work. The focus was on accurate modeling of the physical behavior, especially the multi-staging, polarization effects and different salt solutions up to their solubility limit. The model calibration and verification were based on results yielded by a novel triple channel VMD bench scale test cell, as well as technical scale system results from experiments with a memsys 2/4-stage Multi-Effect Vacuum Membrane Distillation (MEVMD) plant. The developed model was able to reproduce the system behavior and provides a tool for system optimization while providing insight into channel coupling, pressure staging, and phenomena like self-reduction of the number of working stages with rising feed salt concentration. An overview of membrane and filtration methods for the removal of pollutants such as bacteria, viruses and heavy metals from surface water. This review summarizes state-of-the-art research on dual-layer membranes. Water touches most segments of the petroleum industry and thus cost-effective water management is a key part of oil & gas industry operations.